YouTube is huge. Humongous, even. More video content is uploaded to YouTube in a 60 day period than the three major U.S. television networks created in 60 years. The average YouTube user spends between 15 and 25 minutes a day on the site, but how much do we know about the world’s largest video sharing website? Do you know what the most watched YouTube clip is? Can you name all three founders? Do you know how many times per minute a YouTube link is tweeted? There is a ton of interesting data, info and stats to be learned about YouTube — we’ve delved deep to find 10 fascinating facts. Have a read and let us know which ones you didn’t know in the comments below. YouTube was created by Chad Hurley, Steve Chen, and Jawed Karim in 2005. The three founders knew each other from working together at another Internet start up, PayPal. In fact, Hurley designed the PayPal logo after reading a Wired article about the online payment company and e-mailing the startup in search of a job. YouTube was initially funded by bonuses received following the eBay buy-out of PayPal. You could argue that if there was no PayPal, there would be no YouTube. The founding trio didn’t come up with the YouTube concept straight away. Legend has it that YouTube began life as a video dating site dubbed “Tune In Hook Up,” said to be influenced by HotorNot. The three ultimately decided not to go that route. The inspiration for YouTube as we know it today is credited to two different events. The first was Karim’s inability to find footage online of Janet Jackson’s “wardrobe malfunction,” and the second when Hurley and Chen were unable to share video footage of a dinner party due to e-mail attachment limitations. The domain name YouTube.com was registered on Valentine’s Day in 2005. This, however, caused a huge misunderstanding for Universal Tube & Rollform Equipment based in Perrysburg, Ohio. Its company domain, “utube.com,” was overwhelmed with traffic from people that tried to spell the video site’s name phonetically. 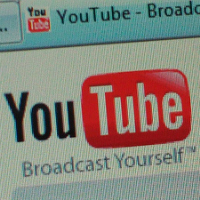 The manufacturing company sued YouTube claiming its business was damaged by the video site, but the claims were dismissed. Nowadays, it seems Universal Tube & Rollform Equipment has bowed to the inevitable — its business site has been moved to utubeonline.com and the original utube.com is a video-themed landing page for bad spellers. The first video to ever be uploaded to YouTube isn’t a classic by any means. Shot by Yakov Lapitsky at the San Diego Zoo it shows co-founder Jawed Karim in front of the elephant enclosure going on about long trunks. It has, nonetheless, racked up a very healthy 4,282,497 views since its online debut on April 23, 2005. The first instance of a “Rickroll” appeared on YouTube way back in 2007. Apparently, it is the evolution of a 4chan prank that originally “duckrolled” users via links that led to a duck on wheels. Now a classic in its own right, the Rickroll has become what must be the most common online practical joke. Back in 2008, at the height of the phenomenon, a SurveyUSA poll suggested over 18 million U.S. adults had been Rickrolled — perhaps more, given that Rick Astley himself participated in a mass-Rickrolling in that year’s Macy’s Thanksgiving Day Parade. 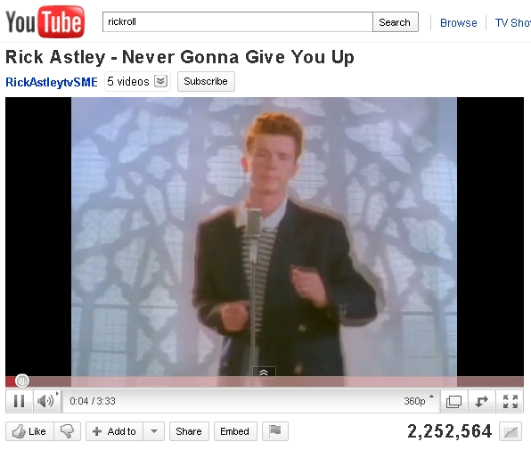 Although Rickrolling has perhaps now had its day, we imagine that figure has easily doubled. For the last three years YouTube has pranked its millions of users every April Fools Day. The first was a classic — every video on the site’s homepage was actually a Rickroll. In 2009 YouTube turned the site upside down and in 2010 an attempt to reduce bandwidth costs saw a “TEXTp” mode introduced, which translated colors in the videos into text. 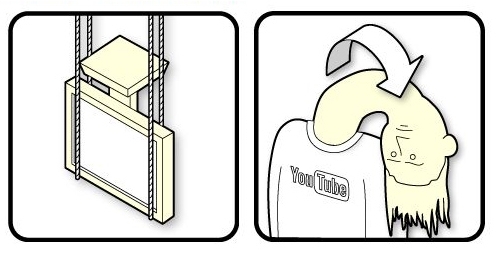 We can’t wait to see what YouTube has in store for 2011. As of February 2011, YouTube has 490 million unique users worldwide per month, who rack up an estimated 92 billion page views each month. 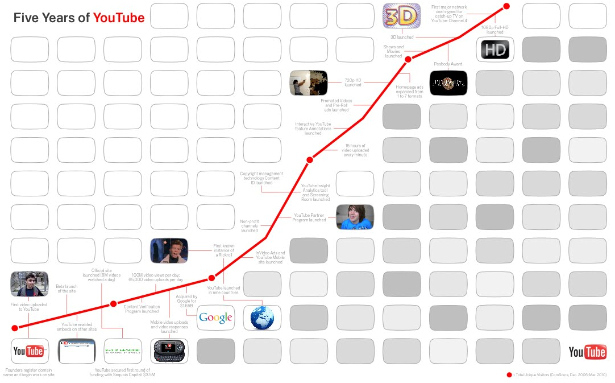 We spend around 2.9 billion hours on YouTube in a month — over 325,000 years. And those stats are just for the main YouTube website — they don’t incorporate embedded videos or video watched on mobile devices. Social media-related YouTube stats are just as impressive. YouTube says that on average there are more than 400 tweets per minute containing a YouTube link. Meanwhile, over on Facebook over 150 years worth of YouTube videos are watched every single day. Not counting music videos (which due to licensing restrictions are often shown only in the U.S. on YouTube), the most viewed video of all time is the classic “Charlie bit my finger,” with an astounding 282,151,886 (at the time of writing). When you include music videos from the U.S.-only VEVO site, then the crown goes to Justin Beiber, whose “Baby” video has over 466 million views and counting. 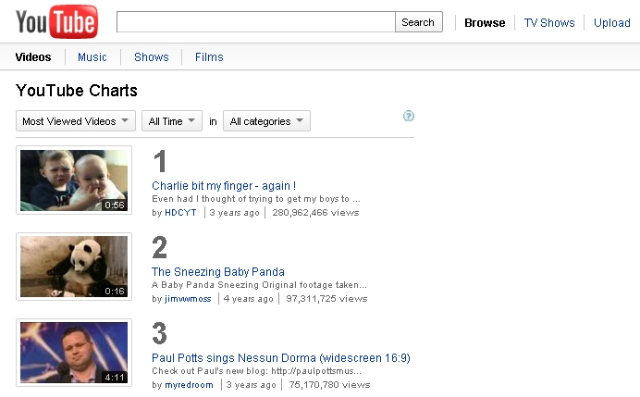 Did you know you can view the “YouTube Charts” at any time to see continually updated info about what’s popular? YouTube has a fun Easter egg that will let you play a Snake-esque game within the video window. The clip above will give you a demo, but it’s simple to execute if you’re keen to try it out. Head over to YouTube, click on a recent video from any category, pause it and then hit the left and up arrow keys at the same time. Enjoy! You are currently reading YouTube Facts: 10 Things You May Not Have Known at Fahrenheit Chronicles.